I’ve fielded a few questions about Chris’s claim that the price action in the 3yr contract suggested someone had the May employment report prior to the release at 11.30am today — so I figured it might be worth posting my reply on an open forum. 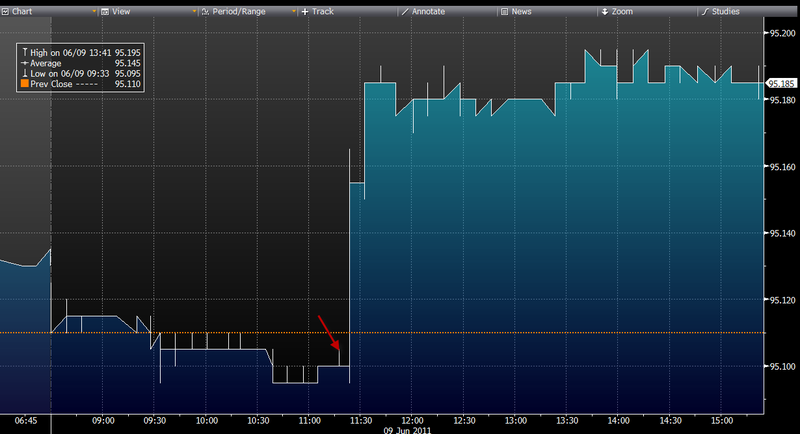 The above is a tick chart from my BBG terminal. The suspect price action is the uptick just before 11.30. I’ve marked it with a red arrow so you can see it clearly. It’s small, but if the market was liquid it’s possible that it could contain a lot of trades. The above is a trade recap table, which shows the history of trades – with volume at price and time exchanged. 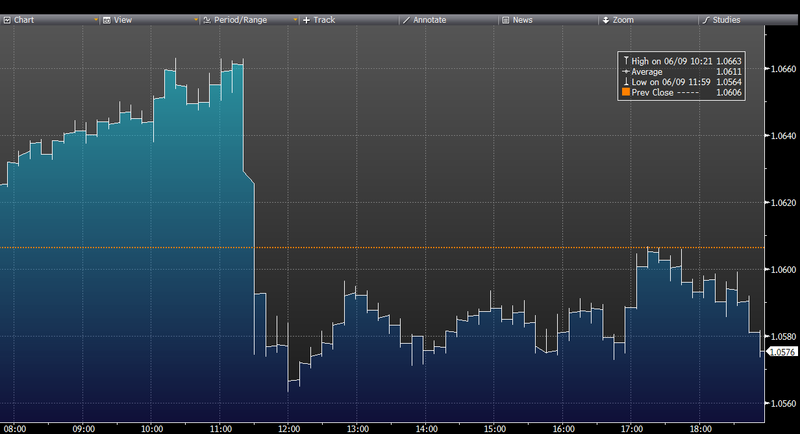 What Chris probably noted was that someone paid up to 95.14 to trade just prior to the release at 11.30am. 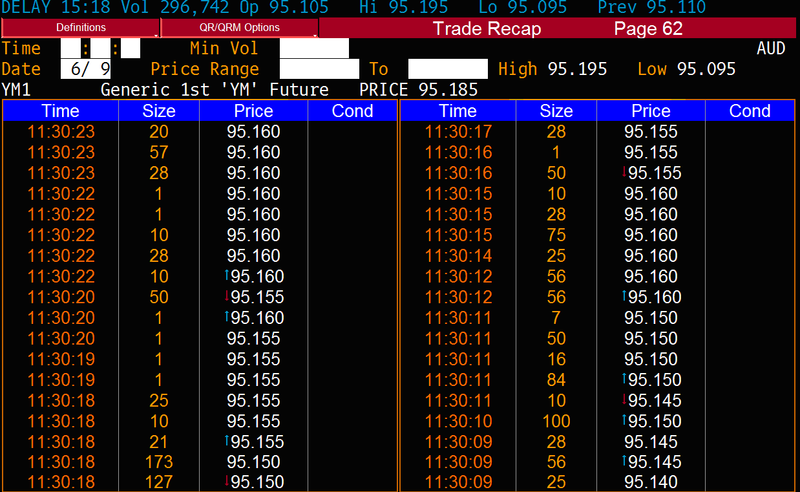 By my count, there were 166 contracts at a weighted average price of 95.12 that traded between 11.29’30 and 11.30. Next up is a table of trades for the 23 seconds or so after the number. 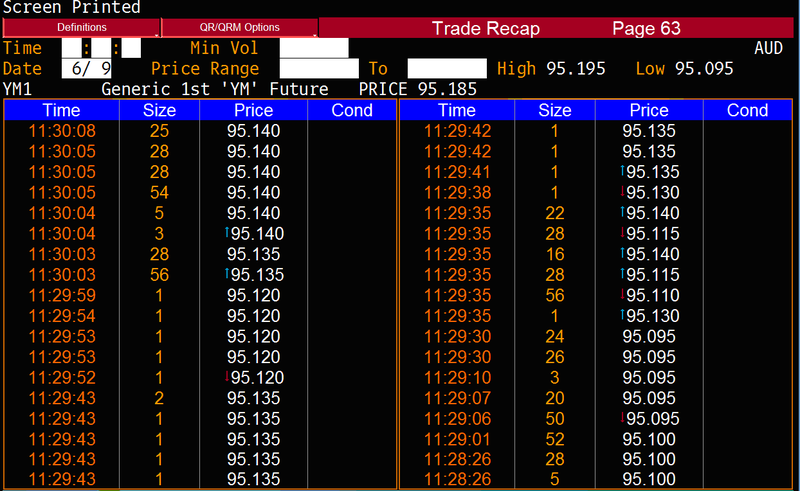 Note the higher trade volumes – more is done in each clip, at each price. Anyhow, supposing that Chris is right – the market is now 95.185 bid (so our well informed punter could exit at that price) – and book a cool ~30k. For mine, the price action is not suggestive of anyone with inside information. The trade size and volume is tiny, and is consistent with folks clearing up risk prior to a number. Above is a tick chart of the AUD (where you can get lots more size on in less time) and I don’t see a sign of something untoward in the price action. Look again at the first chart – you can see that the market had been heavy all morning, so it doesn’t look to me like someone was pre-positioning for a BAD number. In conclusion, I doubt that anyone other than a few folks at the ABS and in the Treasury lockup had the number early – and I very much doubt that anyone was trading with that information advantage at 11.29am. If I knew the release number details a few minutes in advance, I would play in the forex market : short AUD; volume there is massive. Probably that happens all the time. You can make a lot of money in a few seconds in forex and your trades are hidden in the massive volatility that happens after a major release. Agreed, fx is best for size and it is unregulated. I doubt there was an inside trade.